Four people – I’m not so sure it’s appropriate to call them climbers – died on Mt. Everest this past Saturday, 19 May. One of them was a thirty-three-year old Canadian woman; so the incident has received prominent coverage and comment here in the Canadian media. It was a long-standing dream of Mississauga-resident Shriya Shah-Klorfine to conquer Everest. She was born close to the mountain - in Kathmandu, the Nepalese capital. She grew up in Mumbai, India, and emigrated to Canada in 2000. Unfortunately, that dream of hers – not to mention her $65,000 investment in the adventure – pushed her to ignore the advice of experienced Sherpa guides, who advised her to turn back from her summit-attempt, while she still had a chance to get down to safety. She insisted on continuing – reportedly mentioning the money she had spent to get there. She did reach the summit, but died only a hundred metres or so from it, as she collapsed of exhaustion and high-altitude sickness near the beginning of her trek down. Although Ms. Shah-Klorfine must take the ultimate blame for her unfortunate fate – and I say that with all due respect to her memory, and with commiserations for her family and friends – what happened on Everest last week was a fiasco and a moral disgrace. Four deaths in one day – not because of an avalanche, or a plummet down a deep crevasse, but because of a preventable traffic jam. No controls; no regulations. Free-enterprise adventurism gone terribly wrong. The whole Mt. Everest scene has morphed away from what used to be the ultimate climbing challenge for highly-experienced mountaineers into the ultimate tourist-destination for those seeking a glamorous and impressive adventure. These days, for $2,000-$5,000 you can sail to the Galapagos Islands; for $10,000-$30,000 you can take a cruise to Antarctica; and for $60,000 you can join an expedition that will guide you all the way to the summit of Everest. No experience required. 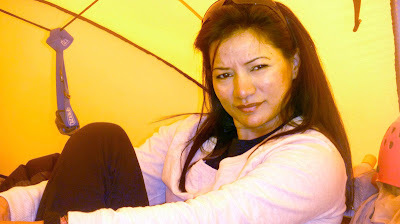 Ms. Shah-Klorfine was not a climber: she had done no mountaineering; she had no high-altitude experience at all. Her only preparation was fitness conditioning – for about 18 months she ran, or walked, 17 km a day with 20 kg on her back. This phenomenon of small, private companies guiding tourists willing to pay the high fees has dominated the climbing of Everest for many years. It’s all an economy of scale. These expeditions usually consist of two or three leaders with high-altitude experience, and familiarity with Everest, and a crew of about ten Sherpa guides. The companies finance their expeditions with the $50,000 fee from each individual participating. They are often not too choosy in the candidates they accept. Shah-Klorfine was with the Utmost Adventure Trekking Pvt. Ltd. The last major disaster on this scale goes back to 1996, when 8 people died on the mountain - five of them were with two companies similar to the one Shah-Klorfine went with. The cause of those deaths in '96 was, primarily, bad weather. But too many people going for the summit at the same time was a contributing factor back then, too. 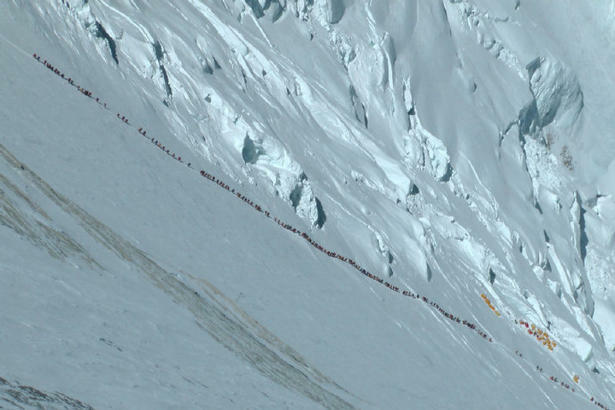 This year it was definitely sheer numbers that led to this calamity – there were about 205 “climbers” who attempted to reach the peak on the same day. Why? The government of Nepal collects a $10,000 fee for every individual license granted for those who want to climb Everest – at 8,848 metres, the highest mountain in the World. This year they sold about 340 permits. But there are no controls on the number of permits sold, or the actual time when the climbs will happen. The permit is good for any time during the short climbing season. It all depends on the weather - and the weather dictates that the annual climbing season in the Himalayas runs from late-March to the end of May – just before the monsoon in June makes climbing impossible. Invariably, by the time all the preparations are made, and the expeditions complete their treks to Everest base camp, and the climbers acclimatise themselves to the high altitude, it is early-to-mid-May before they reach the higher camps and are perched on the upper slopes, waiting for the appropriate weather that will allow them to make their final push for the top. This year, the weekend of May 19-20 was the first opening of clear weather for the season. Everyone who had been waiting impatiently on the mountain’s upper slopes seized the opportunity. 205 people hooked onto a line of fixed ropes running all the way from Camp 4, on the South Col, to the summit. The only problem was the final significant climbing obstacle – the rather tricky Hillary Step, named after the famed New Zealander, Edmund Hillary, who - along with the Sherpa Tenzing Norgay - was the first climber to get to the top of Mt. Everest, on 29 May, 1953. There was a huge bottleneck at the Step, a 12-metre rock face. Scores and scores of people had to wait up to two hours to get their turn to climb up and over. By the time they got to the summit, and then encountered the same traffic jam on the way down, they had spent almost six hours close to the summit. Camp 4 sits just below 8,000 metres above sea level. 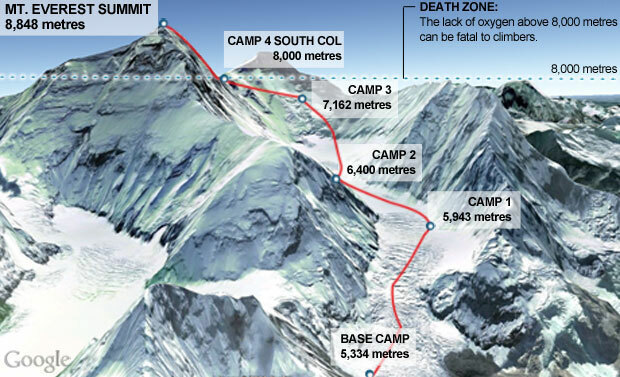 Above that, climbers are into the so-called “Death Zone”. At this height, the air is so thin that they are at a very high risk of altitude sickness. The body starts to deteriorate rapidly. 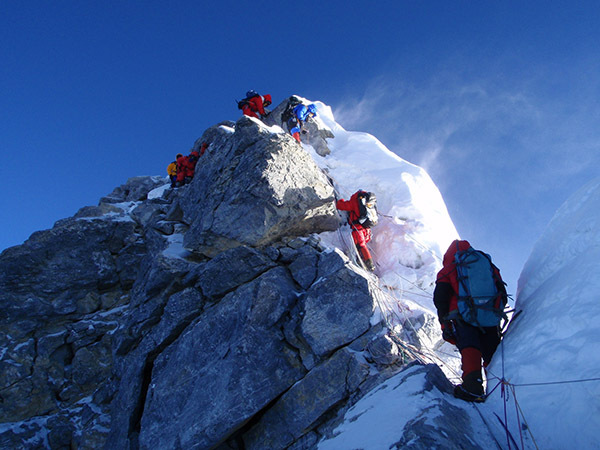 Normally, when numbers are small, climbers leave Camp 4 at dawn and reach the top in about 5-6 hours. They descend to Camp 2 and the more comfortable altitude of 6,500 metres by dusk on the same day. These days, with so many people on the mountain, climbers leave the previous night, arrive at the summit some 12-14 hours later, and often do not get back to Camp 4 until late the following night. People are exposed to the dangers of the Death Zone for two to three times longer than they ought to be. 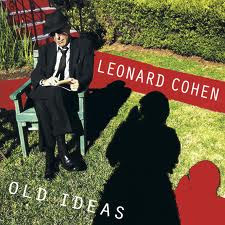 “I really want to go. I really want to reach the top,” she replied. Mr. Thakuri reported that he could not persuade Ms. Shah-Klorfine to give up her climb. “She was telling me: ‘I spent a lot of money to come over here. It’s my dream’ ". With two guides beside her all the way, she got to the summit at about 2:15 p.m. Coming down, however, she succumbed to complete exhaustion. On the way down, as often happens, the weather changed. It was reported that strong winds hit the mountainside and she became disconnected from her oxygen supply. Or, perhaps, she had run out of oxygen bottles because of the long delays caused by the traffic jams. Two Sherpas were with her. It was very slow walking. They tried to support her. And then she couldn’t walk anymore. It was very late. She collapsed. “Save me,” she pleaded. But it was too late. Those were her last words. Something must be done. The government of Nepal should establish some basic regulations about the number of permits available each season. The companies organizing expeditions need to demand rudimentary experience. Some of the “climbers” (inexperienced tourists, really) didn’t even know how to attach crampons to their climbing boots. Some had no experience rappelling, and required Sherpas to help them get down the Hillary Step. They should have at least a few years minimum of serious mountain climbing on rock and ice; they ought to have some experience with high-altitude ascents. And these amateurs need to show some humility and recognise that they are in over their heads. Their hubris, after all, doesn’t only put their own lives at risk – they endanger the safety of other climbers on the slopes. And put the lives of their Sherpa guides in jeopardy. Mt. Everest is an awesome challenge - the ultimate thrill for the experienced climber. But it is an unforgiving place. Nobody on the mountain can take anything for granted. Rank-amateurs should not apply. May Ms. Shriya Shah-Klorfine rest in peace. Thanks for your response. I can agree with you up to a point - but doesn't the state need to regulate in order to protect the health and safety of the general public from the behaviour of inexperienced and irresponsible individuals? Should I be allowed to participate in a Formula 1 car race, just because I want to - even though I've never raced before? Individuals sometimes make unwise decisions: regulations are justified in order to protect them from themselves and, more importantly, to protect others. Your freedom is justifiably limited because of its potential harm to others. 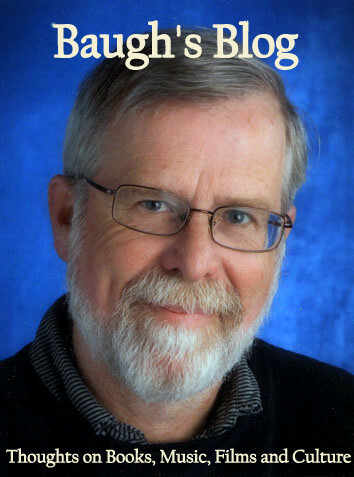 I agree with Mr. Baugh. Regulations and a few prerequisites are an absolute necessity. In most states you cannot get a driver's license without first obtaining a driving permit. After six months, and twenty hours of instructed driving, you may test for the actual license. This prevents individuals from killing themselves or others due to arrogance,stupidity,or a lack of experience. Why should it be different for mountain climbing which is every bit as dangerous if not more so? The state shouldn't have to be your "Nanny", but sometimes they must assume that role to protect innocent lives. Without a few rules being set in place,you have chaos. 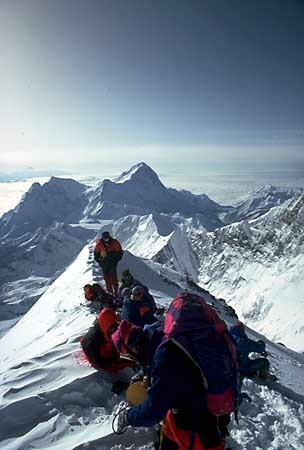 The ill-fated 1996 Everest expedition is a perfect example.. I agree amateurs should not be climbing the mountain. Shame on the companies who will take money from anyone willing to pay it. Formula 1 is the pinnacle of professional car racing. One cannot simply enter a Formula 1 race. How did this woman get to the top of the mountain? was she placed there? She flew from Toronto willfully to do this. Considering how ill prepared she was and the advice given to her by others along with the fact that she didn't even have enough oxygen to make it back down, how can others be held responsible for her death? She went against everyone's advice and marched to her death; if someone is willing to do that how can that person be stopped?